Hear ye, hear ye! We’ve set the schedule for an exciting slate of fall OSU Extension-Lane County Master Food Preserver classes. There are two series: one a continuation of our popular Friday night short, cheap, lecture/demo-style classes; the other a smaller, more exclusive, hands-on class. I’m particularly excited by the very special Pacific Northwest cheese tasting class led by Mary Lou Shuler of Newman’s Fish Market on Friday, Sept. 30. Don’t wait to make your reservation for this one! All classes will be held at the Community Church of Christ located at 1485 Gilham Road, Eugene. You will receive intensive training at these two “hands-on” classes, then take home the items that you learned to make! Classes Start at 9:30 a.m. and end at 2:30 p.m. Classes are limited to 8 participants, so register early to save your place. Registration Fee is $50.00 for each class. October 22nd—Cheese Making. Learn to make 4 to 5 different cheeses; take them home to enjoy! You will learn the techniques and receive the recipes. Lunch is included (with cheese, of course). If you have always wanted to learn how to make cheese, here is your chance. Register early as this class will fill up fast! 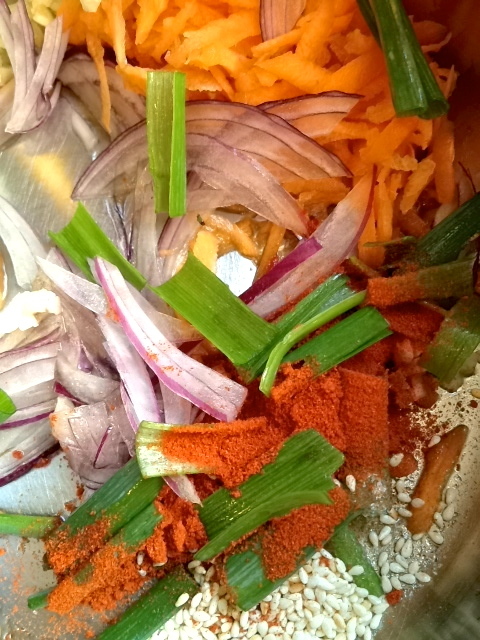 November 5th—Fermented Foods. We’ll start with sauerkraut and move to kimchi, bake some sourdough bread, make a little sour cream and crème fraîche, kefir too! You will also learn how to make vinegars! This class will send you home with wonderful products you made yourself to enjoy with family and friends. 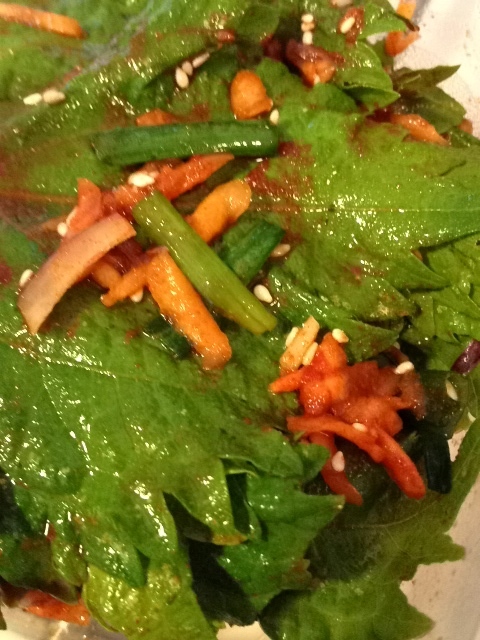 Lunch with fermented goodies, including chocolate (we bet you didn’t know)! Lunch is included. All classes will be held at the Community Church of Christ located at 1485 Gilham Road, Eugene. Classes Start at 6:00 p.m. and end at 8:30 p.m. These fun classes are in a lecture/demo format, and accommodate more people than the Saturday classes. SPECIAL!! September 30th—Cheese Tasting. The Master Food Preservers present an evening of cheese tasting, featuring cheeses made in the Pacific Northwest. Hosted by local cheese specialist, Mary Lou Shuler of Newman’s Fish Market. Lots to learn and lots to taste. Join us for an evening of cheese delight. Registration Fee is $20.00 per person. October 14th—Apples and Pears. Learn to cook and preserve a variety of these delicious seasonal favorites. You will receive information on varieties; how to store the fruit throughout the season; and when the fruits are available. Come and join us. Taste lots of samples! Registration Fee is $15.00 per person. November 11th—The Turkey Show. Varieties and how to choose them; frozen vs. fresh; safe storage and handling; smoking; brining; stuffing; roasting; gravy; what to do with leftovers. Just in time for Thanksgiving. Take away knowledge that will enhance your dinner and promote food safety. Lots of samples! Registration Fee is $15.00 per person. December 9th—Sweet Breads & Fancy Shaped Breads. Simple bread dough recipes plus How-to-Help with Making Holiday Gift Baskets. Purchase items at our Holiday Gift Bazar on December 3rd, then learn how to arrange your freshly made goodies in a Holiday gift basket. Registration Fee is $15.00 plus $5.00 for materials. And last but not least, Oregon State University Extension Service is celebrating its 100th Birthday on September 22. You are invited to join in the festivities and check out our temporary home. OSU Extension Centennial Celebration Open House, September 22, 2011, 2:30 – 6:00 p.m., Extension Office – 783 Grant Street, Eugene. Light refreshments will be provided. Nice things in my life lately are orange. 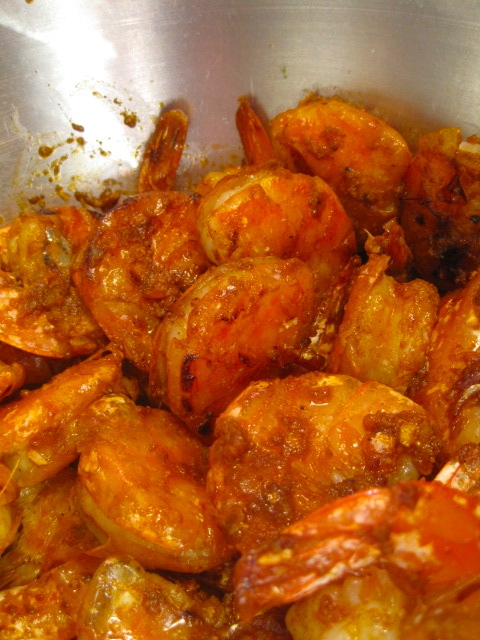 Prawns beriberi with butter and the Ethiopian hot pepper blend, beriberi powder. 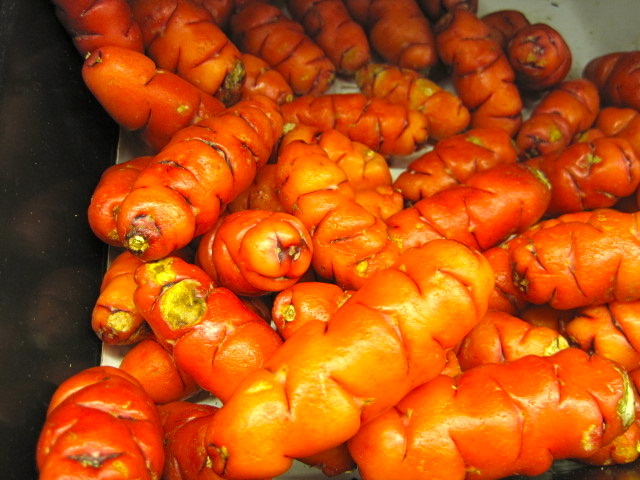 Fresh apricot-colored oca, a South American starch, at Berkeley Bowl. 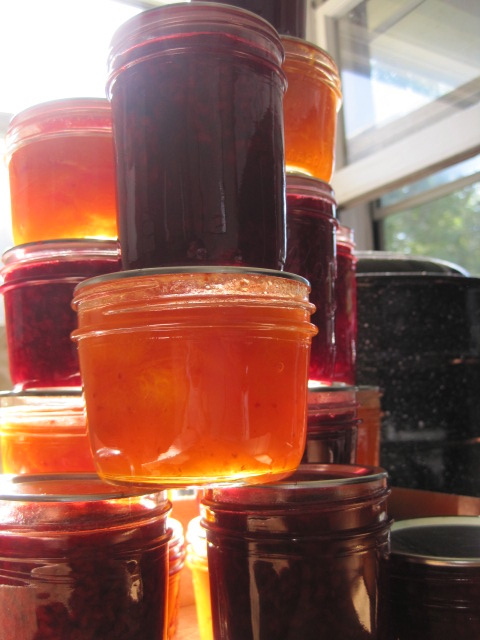 More jam, but this I made in Oakland with my friends from their very own loquat tree. 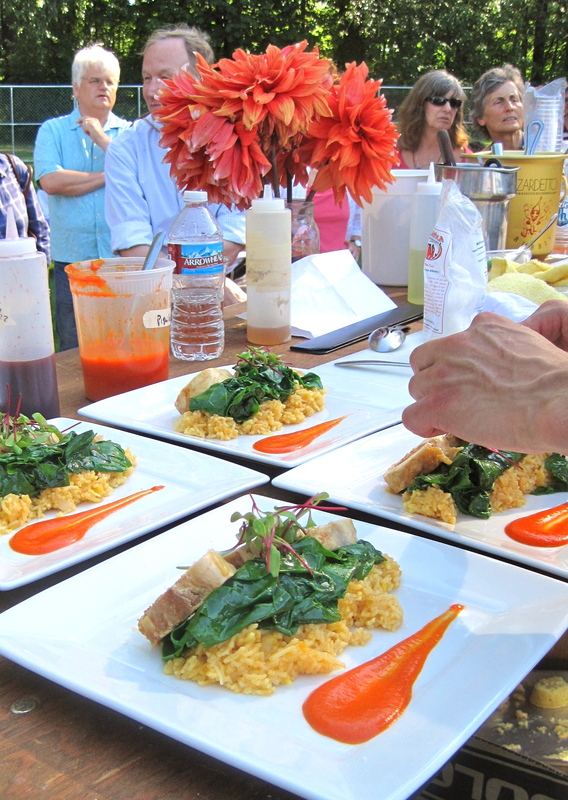 One of my favorite dishes at the Iron Chef Eugene competition, a rearranged arroz con pollo by Mike Meyer of Red Agave, with sauce swath inspired by dahlias brought by his daughter. A Holy Donuts! 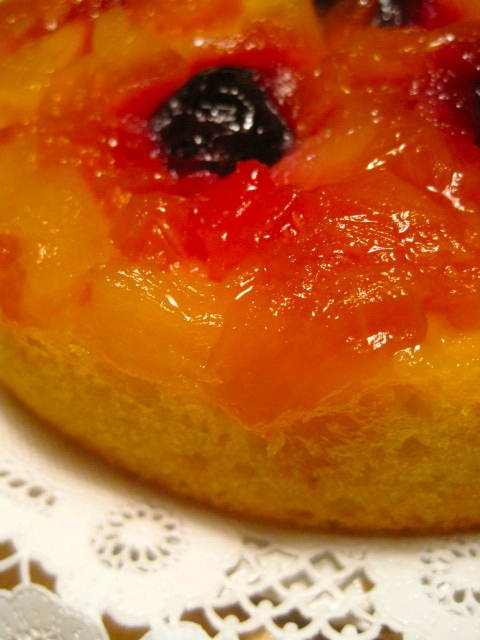 pineapple-apricot upside down cake delivered to my door. Note to self: lend cookbooks to bakers! My neighbors came over to help me devour it. oregon mfp food safety hotline 2011 open for season! Canning for the first time? Wondering if Grandma’s pickle recipe is safe? The annual Oregon MFP Food Safety Hotline is now open through mid-October each week from M-Th 9-4 p.m. We welcome all calls from Oregon with questions about food preservation and safety. This is the first year the hotline has been located in Douglas County, after many years in the now-defunct Lane County Extension office. Believe it or not, certified Lane County volunteers are making the trip down to Roseburg on a regular basis to train and staff the hotline this summer. Didn’t I tell you these ladies were dedicated volunteers? Headed up by our beloved Donna Crosiar (above), who has forgotten more about preservation than I’ll ever know, the hotline is still in good hands. By the way, if you want research-based preservation recipes, we have them up on our Lane Extension website. Hard to find a link (and negotiate that site in general), so I’m linking them here. 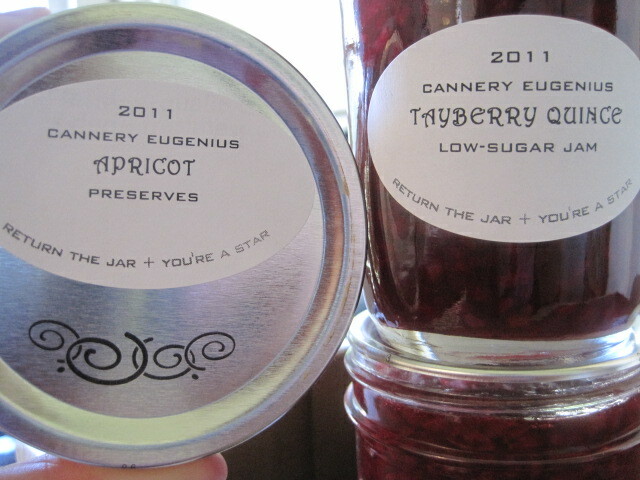 summer canning class series — only forty bucks! Behold the breakfast my husband made me on this, the holiest of all days, last day of classes in spring term. And it’s sunny! I think I speak for everyone — faculty, students and staff alike — when I say HALLELUJAH! Can I get an amen in here? 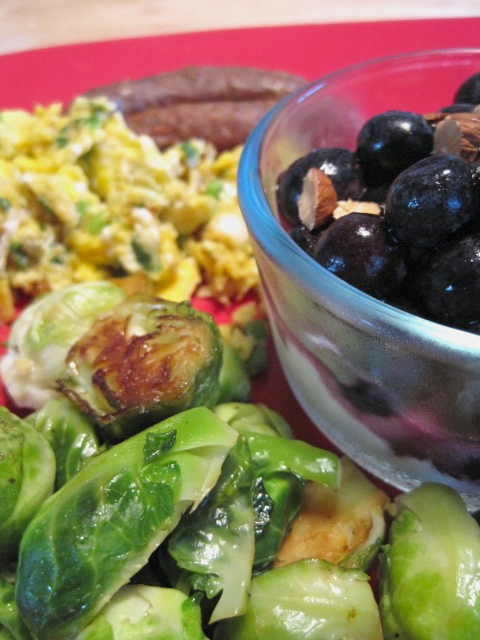 So, as I eat my Sweet Briar farms breakfast sausage, sauteed brussels sprouts, scrambled eggs with scallions, and blueberry yogurt parfait, let’s start some serious summer food planning. 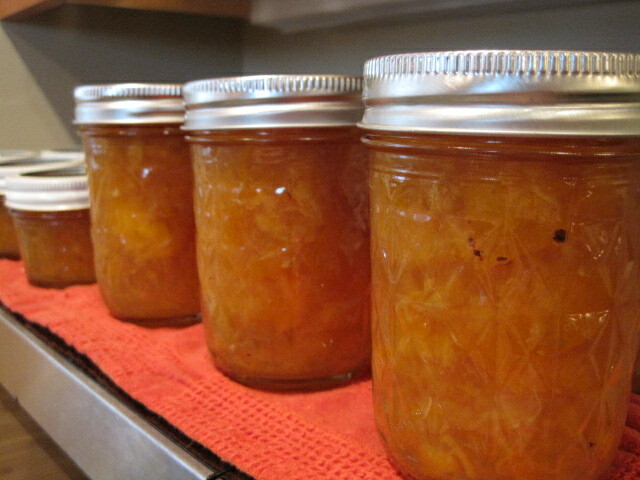 Have you signed up for your canning basics summer demo course series through the Master Food Preserver Alliance? 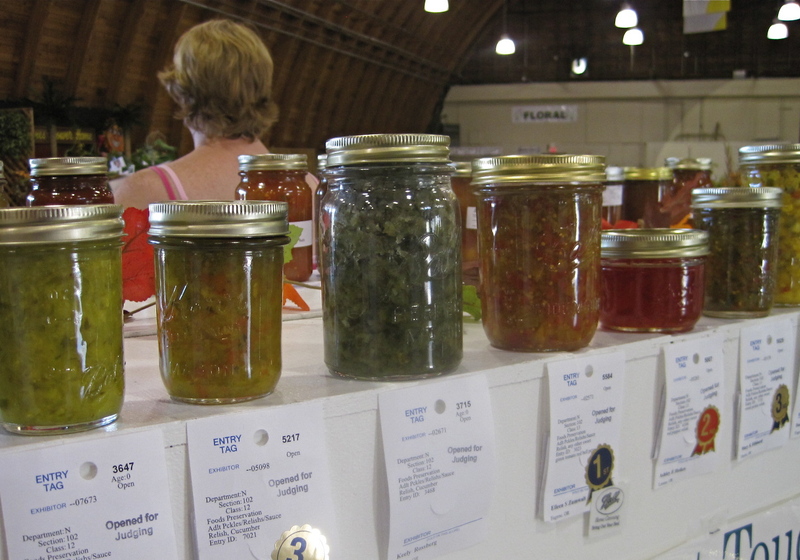 It’s a very low cost set of four classes covering everything to get you started: jams, pickles, waterbath canning (tomatoes), and pressure canning. Fifteen dollars a class, or even better, $40 for the series. These classes are meant to demystify the process with demos, and they aren’t comprehensive, but it’s a great way to start canning safely and meet the MFPs in your neighborhood. Plus you’ll get plenty of samples and tips. Featuring demos by certified volunteers with the OSU Extension – Lane County Master Food Preserver Program. 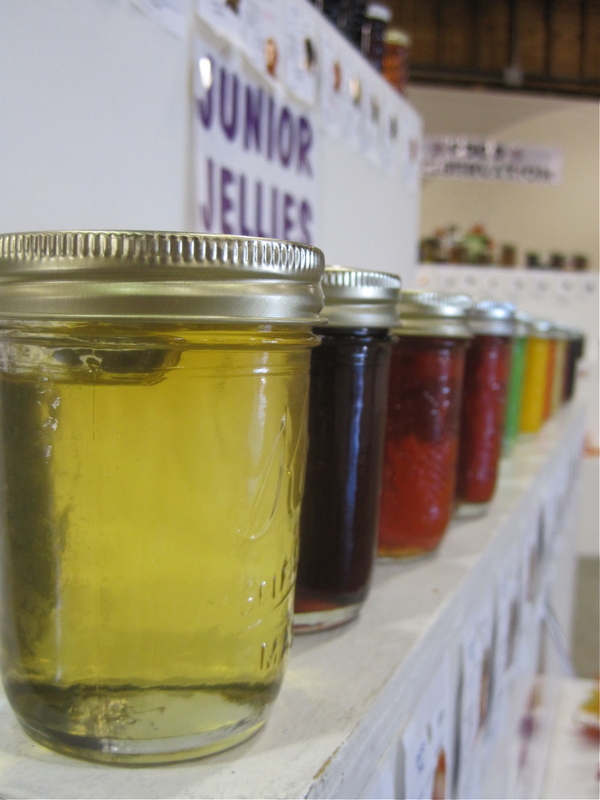 JAMS AND JELLIES: June 17, 6-8:30 p.m. Cost $15. Community of Christ Church, 1485 Gilham Rd., Eugene. 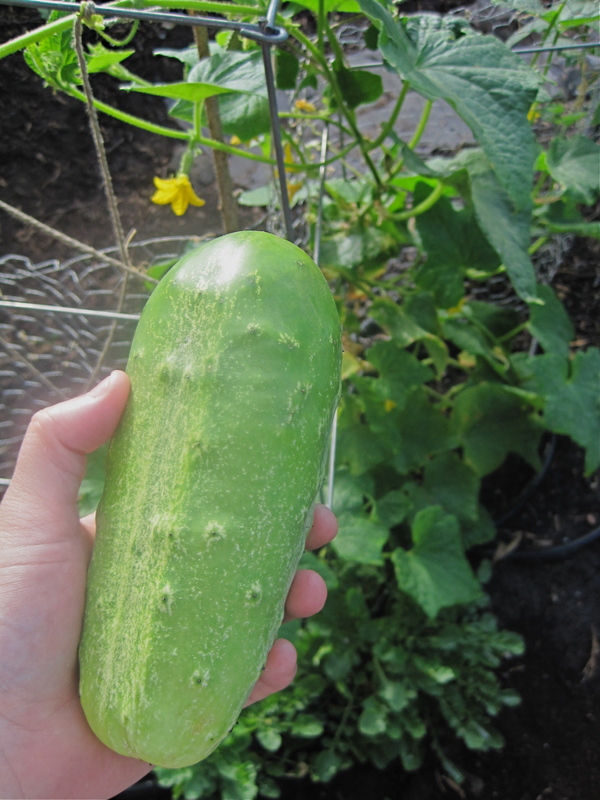 PICKLING: July 22, 6-8:30 p.m. Cost $15. 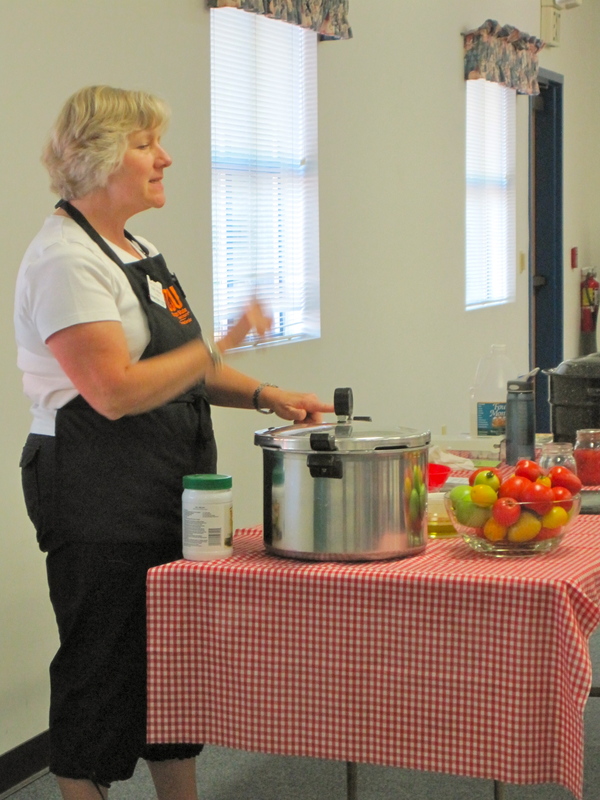 WATERBATH (Tomatoes and Salsa): August 26, 6-8:30 p.m. Cost $15. 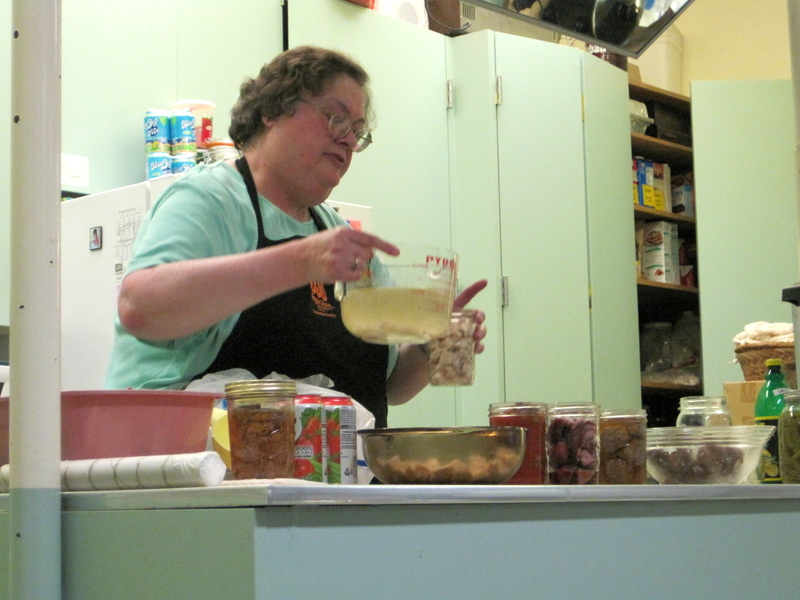 PRESSURE CANNING (Meat): September 23; 6-8:30 p.m. Cost $15. St. John the Divine Church, 2537 Game Farm Rd., Springfield. Summer Series (all four summer classes). Cost $40. I’m leading the pickling class in July. Any requests? I think we’ll discuss cucumber pickles, canning fermented pickles, and quick pickles, and do a demo on dilly beans. Register for the series or a single class on the OSU Ext. Lane County MFP website here. There will also be classes on canning tuna, demos at Down to Earth and other places, and more classes as we’re able to schedule them. I admire the sneaky ones who hide under the leaves, trying to develop to maturity. 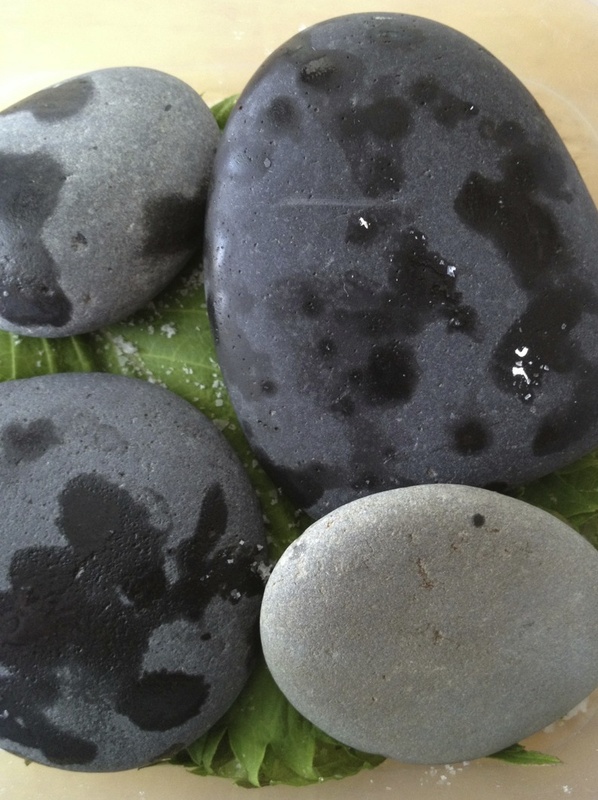 But Anthony Boutard of Ayers Creek Farm posted a link to a German recipe on his newsletter that seals their fate, too. Old, overripe, yellow cucumber pickles! And their name: senfgurken. Irresistible. 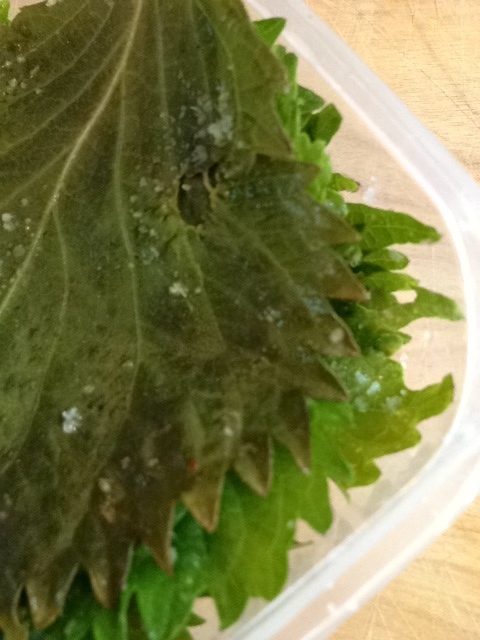 Anthony says he substitutes tarragon vinegar for the white wine vinegar. I haven’t tried the recipe, but it looks great, not to mention dissertation-writing-neglectful-gardener friendly. Maybe I’ll let a few more go. 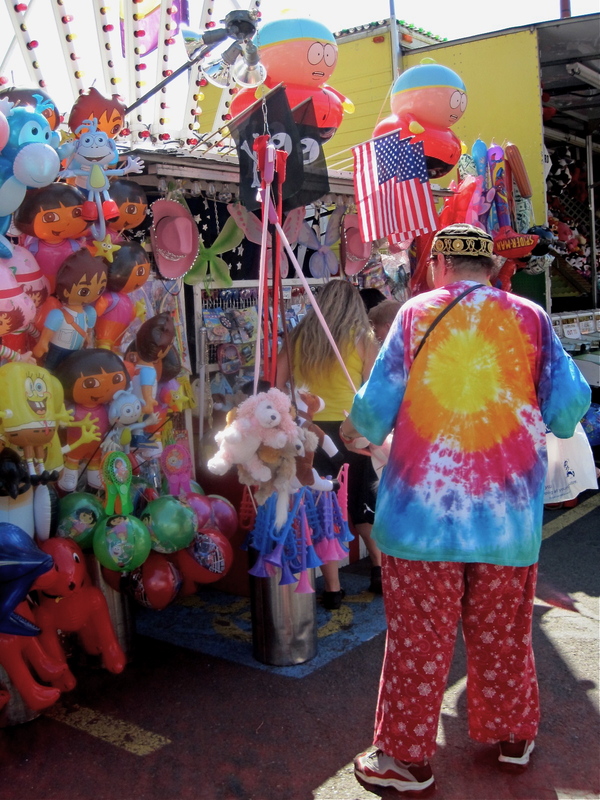 Have you been to the Lane County Fair yet? I gave my talk on blackberries there the other day, but it was so hot I couldn’t spend more than an hour walking around and looking at the exhibits and rides. Still, I managed to snap a few shots of the local color. Fun to look at all the canning efforts, some so much better than anything I’m capable of doing; others, well, grey dill relish. 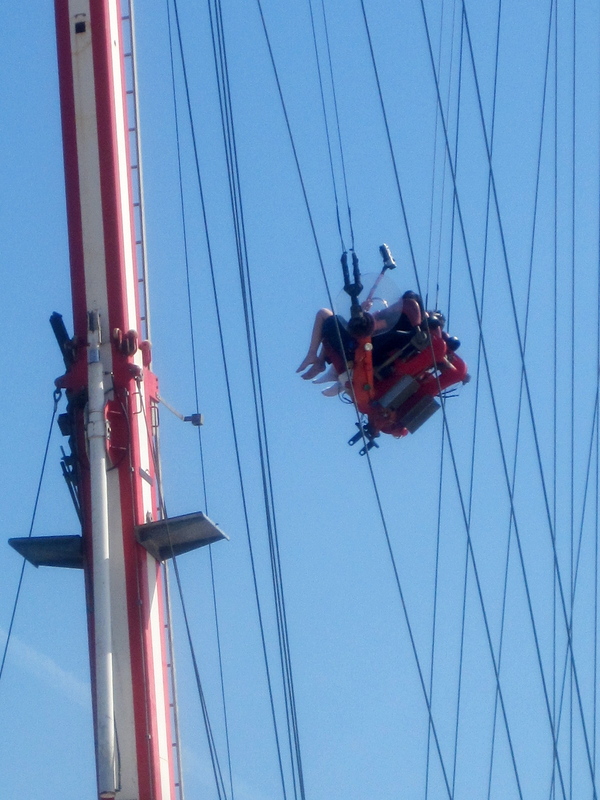 Let’s hope the safety belt is operating properly!